Everyone was showing their colors at Premiere Cinema in Eastern Shore Centre on I-10 this weekend. 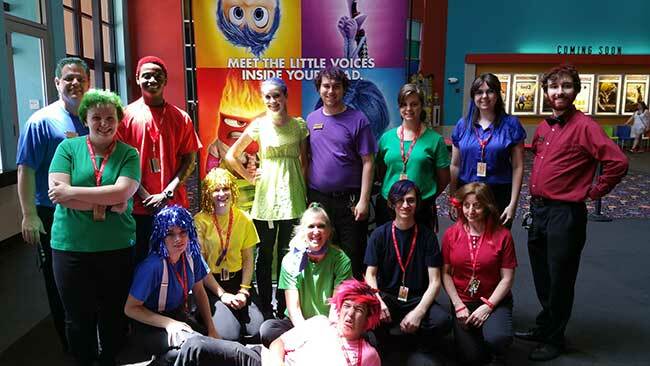 As if the beautifully-appointed cinema isn't vibrant enough already, Director Dan and his fabulous Cast & Crew paid homage to Disney/Pixar's highly-anticipated animated masterpiece "Inside Out" as it debuted to a whopping $91 million opening weekend domestically. That's a bigger opening than even Disney's epic record-setting "Frozen" had. The Cast & Crew coordinated their colors to represent the adolescent emotions characterized in the new film which include joy, fear, sadness, anger and discust, all occuring within the mind of 11-year old Riley, a Midwestern girl just like any other. The film has achieved universal critical and audience aclaim. It is now showing at Eastern Shore Premiere Cinema and other Premiere Cinemas across the nation.